I’m a landscape photographer living in the South Downs. Previously a software engineer at IBM, I retrained as a technical illustrator, before picking up a camera … and paint brushes and secateurs, but that’s another story. Charlotte Gibb is an award-winning landscape photographer based in Northern California with an eye for the subtle and sometimes overlooked beauty of the natural world. She earned her Bachelor of Arts degree from the Academy of Art University in San Francisco, writes and publishes on the subject of photography, and serves as a judge for an international photography competition. Her work has been exhibited in galleries throughout California. Living where I do in the South Downs, trees dominate the scenery. Perhaps it’s not surprising, then, that I’ve selected a photograph by Charlotte Gibb whose tree shots I’ve recently discovered and enjoyed. 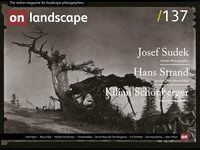 A quick search of On Landscape reveals she was included in an Endframe article back in 2015. This composition has so many aspects that work for me. Where to start ? Strip out the golden leaves and the image could stand as a graphical arrangement of grey/white trunks fronting a mosaic of silvery, grey scrub - starting with warm tones at the front, receding to cooler in the background. The trunks are not too regimented, but naturally varied. I wonder how many versions Charlotte took of this scene ? I can imagine her working to get the alignment just right, maybe moving around to allow ‘breathing spaces between the trunks, while somehow managing to fashion the arrangement of the leaves. At first glance - the usual millisecond on-line “wow” we are inclined to give photographs these days - I saw a colourful contrast and some interesting shapes. Then, after pausing a few moments more I began to see the leaves in a form of their own. I see three diagonals from left to right. We’re told that compositionally, diagonals have an an energy of their own, and we tend to read from left to right. Maybe this contributes to the image’s success ? Yes, the colours are something that an inhabitant of southern England might envy a little, but this composition is more than just a splash of golden leaf colour and stark trunks. The image’s graphical appearance is enhanced by the apparent layers. The trunks are in one plane, the leaves in another - the depth of field being allowed to gently blur the background, emphasising the main subjects. I wonder how much analysis actually goes on when we photographers compose our images? When we begin, it’s probably down to getting the camera set-up ‘correctly’. Later, with a little more experience, some might say it becomes a more innate skill: second nature. I’m far from this stage and hopefully will never get there, as the endless joy of seeing things differently each time is very important to me. All in all, this is a photograph I’ve enjoyed looking at and thinking about. … I’ve just realised this image has a hint of that powerful orange/blue complementary colour combination. More to see with each look, but probably that’s enough from me. I hope you enjoyed this wonderfully, vibrant, but surprisingly complex, photograph.